Goa has always been epitomised as a verdant paradise, with abundant lush greenery and an array of indigenous flora and fauna. The Western Ghats, which form a part of Goa’s natural heritage, are especially blessed with species that are yet being discovered. The ecological significance of the Western Ghats and the areas of it that are part of Goa is essential to the conservation of this region. The monsoon season in Goa is particularly synonymous with the easily recognisable croaking of frogs, emerging somewhere from the muddy pools of water through the evening till night. 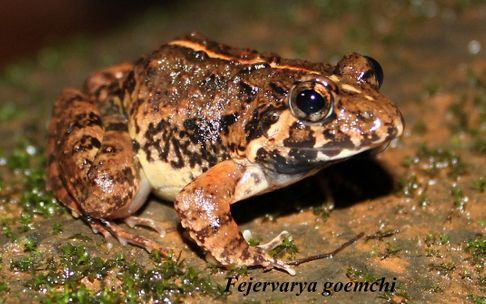 The chorusing ‘trook, trook’ heard in the highland plateaus of the Western Ghats regions of Goa, with the unusual calm lent by its rhythm, is associated with the breeding season of the frog – namely, the large-sized terrestrial fejervaryan frogs. These mainly terrestrial frogs are nevertheless found near water bodies serenading females in the hope of mating and breeding. The water bodies are essential for continuance of breeding since frogs mate in water, and the survival of the eggs and later on tadpoles depends on water. The eggs are covered with a jelly-like mass that will dry up without water and the tadpoles have gills like fish before they transition into full-grown frogs. Found all over Asia, these frogs come in varied sizes, ranging from small (19 mm) to large (56 mm). The morphological similarities give rise to difficulties in identifying fejervaryan from only the basis of external characteristics. Consequently, this causes taxonomic uncertainty in terms of names, identification and systematics (the study and classification of living organisms). It takes a team of experts to be able to distinguish and classify these frogs correctly. In the case of the new species of the large fejervaryan frog, the credit of discovery and classification goes to the team led by Dr K P Dinesh, from the Zoological Survey of India, Pune; Mr Nirmal Kulkarni of the Mhadei Research Centre, Goa; Ms Priyanka Swami of the Centre for Ecological Sciences, Indian Institute of Science, Bangalore, and Mr P Deepak of Mount Carmel College, Bangalore. Their findings on a new species of the large fejervaryan frog have been published in the recent edition of the Records of the Zoological Survey of India. Fejervarya goemchi is the name of the new species, so called after the historical name of the state of Goa where the species was discovered. This new species of fejervaryan frog, Fejervarya goemchi, is a large-sized frog measuring from 41.0 mm to 46.0 mm. Its peak activity in the field begins with the onset of the monsoon in June to the post monsoon season in September. Since most fejervaryan species in South and South-east Asia are challenging to classify on the basis of morphology alone, the authors/team members have used a combination of morphology, geographic distribution range and molecular methods to describe the new species. Additionally, the authors have provided an overview of the systematics of the group and recommended additional sampling across the Asian continent. What is known of the locations preferred by the new species is that it can be found in the high altitude areas of lateritic plateaus, temporary water bodies and the paddy fields of the Goa. It is quite a prolific frog producing progeny abundantly. More detailed studies of this species, however, are necessary to map its distribution range and understand its biology. This discovery is an outcome of the collaborative research efforts by the scientists of the Zoological Survey of India (ZSI) and the Open Taxonomy Initiative, supported by Dr Kartik Shanker and Dr S P Vijayakumar at the Evolutionary Ecology Lab at Centre for Ecological Sciences (CES), Indian Institute of Science (IISc), Bangalore. The team led by Dr K P Dinesh and Mr Nirmal Kulkarni must be remembered and lauded for the discovery of the tiny fejerverayan frog Fejervarya gomantaki in the year 2015. With the present discovery of the Fejervarya goemchi, Mr Nirmal Kulkarni and team have discovered five new species of amphibians in the state of Goa. These include the three caecilians (limbless amphibians) in the last decade: Gegeneophis goaensis and Gegeneophis mhadeiensis in the year 2007; Ichthyophis davidi in the year 2011; Fejervarya gomantaki in the year 2015 and Fejervarya goemchi in 2018. Further work and investigation in this sphere will only increase the ecological value of this land of Goa and hopefully contribute to the protection of its vast and hidden environmental treasures.